Fresh red chilli, sliced Archives - Adelaide Central Market: The City of Adelaide's premier food destination. Over 70 traders under one roof. For the marinade, squeeze grated ginger into a small bowl to create 1 tablespoon of ginger juice. Next squeeze the grated spring onion into the same bowl creating 1 teaspoon of spring onion juice. Add salt and Shaoxing wine, stirring to combine. Rub the marinade all over the chicken, including inside the cavity. Place in a non-metallic bowl covered with plastic wrap and marinate for 2 hours in the refrigerator. To poach the chicken, bring stock or water to the boil in a large saucepan and carefully submerge the chicken in the liquid. Return the stock to the boil and remove from heat. Allow chicken to stand for 30 minutes for a 1.6kg bird and 40 minutes for a 1.7kg bird. Carefully remove chicken from hot poaching liquid and plunge into ice cold water to stop the cooking. Meanwhile, bring the stock back to the boil. Add chilled chicken, remove from heat and poach for further 15 minutes. Carefully remove cooked chicken from stock and drain. Cut the chicken into portions (called jointing) and slice the breast meat. 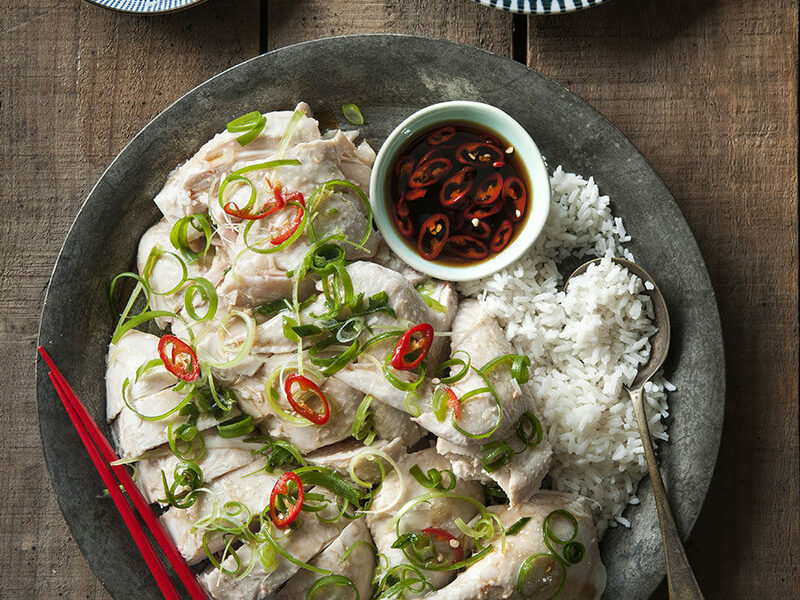 Serve the chicken with rice made using the poaching liquid and the absorption method. Sprinkle sliced spring onion curls over the chicken. Serve with a dipping sauce made from soy sauce mixed with ginger and red chilli pounded together with a mortar and pestle. 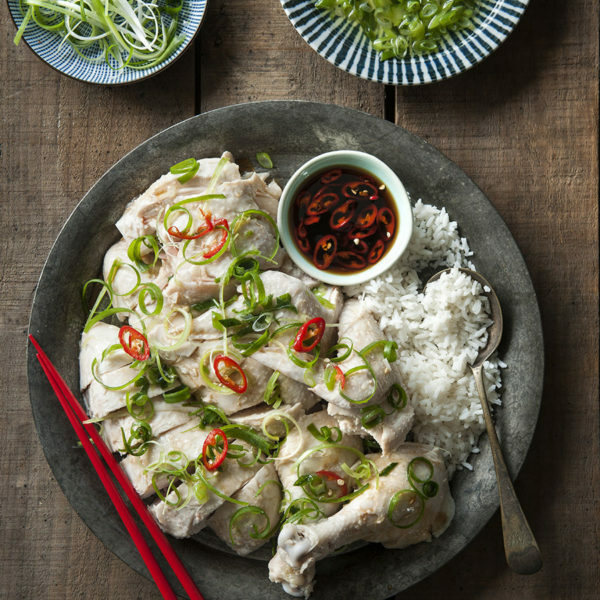 Perfect steeped chicken can also be served with finely minced fresh ginger, rice wine, ground ginger and a little hot oil (hakka style) or some fermented cockles added to finely minced spring onion, ginger and oyster sauce with some warm oil. "The key to this dish is cooking the chicken with care and sensitivity."